For bookings confirmed prior to 31 Oct, 2013 on catamaran MOONSTONE, guests receive a free Scenic Helicopter Tour of the BVI (or a Rendezvous Dive). 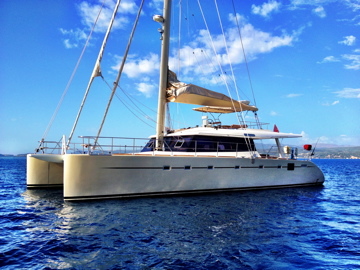 MOONSTONE is a 62ft Sunreef crewed luxury sailing catamaran, accommodating up to 8 guests in 4 private cabins and is ideal for sailing vacations and holidays around the Caribbean. Based mostly around the British Virgin Islands, MOONSTONE is open to chartering anywhere between the Bahamas to the Leeward Islands - during certain times of the year. With amble sufficiency of space for entertaining and relaxing, catamaran Moonstone offers a large internal saloon, dining and galley area, flooded with natural light from her expansive panoramic windows. The vast cockpit offers a large area for alfresco dining and sun pads where guests can relax in comfort in the shade. For sun lovers, the flybridge is the place to be. A bimini on the flybridge covers a small casual dining area and open sunpads are available aft for those who wish to soak up the Caribbean sun. MOONSTONE also offers plenty of sunning space on the foredeck where guests can relax on the trampolines – even when under sail! MOONSTONE is also equipped with plenty of features to keep guests entertained on a yacht charter including a full range of water toys and entertainment facilities.